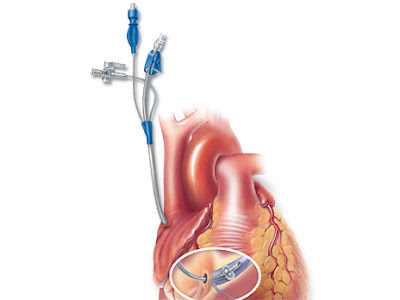 Cardioplegia is a state of heart in which the activity of heart is ceased intentionally before surgical operation. It is also known as paralysis of heart. As the name indicates, cardio means “heart” and plegia means “paralysis”. The heart activity is ceased so that the surgery can be performed properly with no excessive blood loss. Commonly the word Cardioplegia is used for the solution which actually cause heart paralysis. The solution used may be chemicals, cold or electrical stimulation. It causes rapid, immediate electromechanical quiescence and also sustain it. It wash out the inhibitors of metabolism side by side. Provide sudden cooling to the myocardial cells and keep it for time. Cardiac paralysis also known as cardiac asystole, can be achieved by introducing solution into the patient’s body specifically in the coronary artery circulation. This solution is responsible for making the heart survive in ischemic phase during surgery as this solution provide oxygen and all nutrients to heart cells not letting them die. The solution used for this purpose is cold solution. Change in ECG will show that the solution is working and heart paralysis. The cold solution is used to protect heart cells from dying. The presence of potassium in cold solution, reduces the membrane potential of myocardial cells and the depolarization of cells occur more rapidly. This depolarization causes the calcium to pump out and cells to contract more and as a result the cells feel relaxed. It is derived that presence of high concentration of potassium in solution prevents repolarization of cells. Also the muscle fibers do not respond any kind of stimuli. When membrane potential is at resting state, the sodium channels are blocked and as a result the cardiac arrest occurs. When the cardioplegic solution is entered into the circulation via main aortic root which is proximal to aortic x-root then this is known as antegrade Cardioplegia. The solution used in antegrade Cardioplegia may be blood or crystalloid solution. The pressure required for the injection of solution is 60 to 100 mm Hg. The arresting time in antegrade Cardioplegia is fast and may be ranging between 30 to 60 sec. if there is any delay in cardiac arrest then following reasons could be behind it; Problem in delivery system and AR is unrecognized. Leakage in catheter and injury in coronary sinus. The cardiac arrest occurs slowly as compare to antegrade Cardioplegia i.e. in 2 to 4 min. it also provide less protection to right ventricle.